By George W. Malone and Dorothy Abbott-Donnelly, University of Delaware - Planting trees as a visual screen, vegetative filter and windbreak around poultry farms is another opportunity for poultry growers to demonstrate their continued commitment to voluntarily implement a program to be good neighbors and environmental stewards. The Benefits of Planting Trees Around Poultry Farms - By George W. Malone and Dorothy Abbott-Donnelly, University of Delaware - Planting trees as a visual screen, vegetative filter and windbreak around poultry farms is another opportunity for poultry growers to demonstrate their continued commitment to voluntarily implement a program to be good neighbors and environmental stewards. Why should I consider planting trees around my poultry house? Increasing urban encroachment in many poultry producing areas will make maintaining good relations with neighbors even more of a challenge. Planting trees around poultry houses is a step toward creating a positive image for the poultry industry As the trees mature, your farm takes on a more attractive landscaped appearance and creates an aesthetically pleasing view, while increasing property values, both for you and your neighbors. Given time, all aspects of your poultry operation will be obstructed from view (i.e., deliveries, live-haul crews, litter cleanout, etc.) The adage "out-of-sight, out-of-mind" may well be a major advantage of providing a visual screen for poultry operations. Another important aspect of trees is their ability to filter the odor, dust, feathers and noise emitted from poultry operations With urban encroachment, the likelihood of more odor- and noise-related complaints will increase This is further exacerbated by the rapid adoption of tunnel ventilation, which concentrates the discharge from houses during summer. With increased ventilation during warm weather and more outdoor activities by the neighbors, summer is often the most sensitive time of year for nuisance-related neighbor complaints. If residential houses are in close proximity and downwind of tunnel exhaust fans, you may well have an explosive issue on your hands. Trees provide a cost-effective, long-term means of reducing odor, dust, feathers, and noises associated with your daily operations. As shown in the photograph below, trees can be highly effective in scrubbing odor-laden dust particles from exhaust fans. Noise complaints are becoming more of a concern as we convert to tunnel ventilation and operate the larger fans for prolonged periods of time during warm weather. Trees can absorb and diffuse noises resulting in sound levels one-half the original volume . While planting trees around the perimeter of your farm is not a substitute for good management practices, this natural barrier will reduce nuisance complaints and foster better relationships with your neighbors. Planting trees around poultry farms offers many environmental benefits and presents a positive image of agriculture. Ammonia emissions from poultry houses and its contribution to atmospheric nitrogen and fine particulates may be a major issue facing all animal agriculture in the future. Trees strategically planted on poultry farms may help reduce ammonia emissions by physically capturing both the ammonia gas and the ammonia-laden dust particles . Early adoption of a tree program may be one strategy in helping your operation deal with the emissions issue in the coming years. Trees also have the ability to clean the air by capturing carbon dioxide, a greenhouse gas, storing the carbon in the wood and releasing oxygen back into the air. In addition to the leaves' ability to capture various gases, the roots of trees are effective in absorbing nutrients that might escape the proximity of the poultry farm. Trees aid in filtering nutrients in the runoff and groundwater. More than 80% of nitrogen and phosphorus can be kept from entering adjacent water courses through root absorption or reduction in overland flow. With continued environmental scrutiny of poultry operations, emission and nutrient discharge issues will likely increase. Planting trees is another opportunity for you to be proactive and demonstrate your desire to be a good environmental steward. Several years ago, no one promoted planting trees around poultry houses for fear of restricting natural air flow . However, as industry shifts toward tunnel ventilation, blackout and windowless-type housing, this is less of a concern. Overlooked in the past were the potential energy savings of planting trees or windbreaks around houses. Previous research for other applications suggests properly established windbreaks are an energy efficient, natural system that can reduce heating costs as much as 10%-40% and reduce cooling cost by 20%. Strategically placed, trees provide protection during late fall, winter and early spring by reducing wind speed by more than 50%. A 'wind-shadow' of approximately 200 feet is developed on the downwind side of an established windbreak. Protecting houses from the wind may minimize structural damage. During summer, trees may offer some degree of roof shading and cooling the air around houses. As shown in the recent tunnel-retrofit photo on page 3, some innovative growers with conventional houses years ago recognized the benefits of shading roofs. Although this may not be as important for tunnel-ventilated houses, on sunny days, shading the area around houses can reduce the temperature of the ground by 20°F. While actual benefits in reducing intake air temperatures are limited, some preliminary data suggest summer air temperatures next to poultry houses having a shaded (wooded) area on the western exposure may be up to 7°F cooler in the afternoon than air around houses in an open area. Properly designed windbreaks can also serve as a 'living' snow fence. A tree windbreak can capture up to 12 times more snow per foot of height than a picket fence, and it is 90% cheaper. Another potential benefit of trees surrounding the poultry farm may be improved biosecurity. By restricting airborne particulates, trees may aid in blocking airborne poultry diseases from entering as well as exiting your farm. Although trees around the perimeter of houses offer many potential advantages, there are some negative aspects to consider. These include: a limited amount of land will be taken out of production, cost of the trees, labor for planting and maintenance, restricted view of your houses, limit farm access to designated roadways, and a potential habitat for wild birds. A tree program may not be workable for some farms and on many farms the perimeter of the houses may already offer partial windbreak protection. This depends on your farm situation, house orientation, type of ventilation system, tree species and width of the windbreak . For tunnel-ventilated houses and planned retrofits to tunnel ventilation, multiple rows of dense evergreens around the farm perimeter make a good visual screen, vegetative filter and windbreak. On the tunnel fan end of the house, consider additional rows of dense evergreen or deciduous trees for maximum filtering during summer operation. For greatest emissions-scrubbing, tree lines should be as close to the tunnel exhaust fans as possible. As a general rule, to not interfere with fan efficiency, no trees should be planted closer than a distance of five times the diameter of the fans. On the inlet end of the house, consider planting tall evergreens or deciduous trees to provide a 'cooling' effect of the air and soil in summer. Growers are encouraged to consult with their poultry companies to establish minimum distances of trees from houses. Service roads, loadout area and anticipated width of the tree spread at maturity are factors in spacing consideration. Tree planting around conventional-ventilated houses requires strategies to meet different objectives. First, prevailing winds for your location need to be determined. On the prevailing wintertime wind side of the farm, multiple rows of dense evergreens may be used for a visual screen, vegetative filter and windbreak. For the summertime prevailing wind side of the farm consider planting tall evergreens and/or deciduous trees with no lower limbs. This will provide a partial visual screen and shade while minimizing air blockage. For houses having a western sidewall exposure, consider tall, wind-tolerant, deciduous trees for maximum roof shading. In some cases this may be an option between the houses. Plantings on the ends of houses will also require adequate distances to accommodate the loadout operation. The maximum benefit from windbreaks is felt five times the height of the tallest trees growing in the windbreak when the trees reach about 20 years old. Therefore, if the total height of your tallest tree at age 20 is 30 feet, then the maximum windbreak effect will be 150 feet. If the prevailing winter winds are from the northwest, for best 'wind-lifting' effect, on the north and west rows of the windbreak, plant a progression of low evergreen shrubs or trees on the outermost row to taller evergreen trees for the inside row. Several other factors need to be considered. On all farm types, a tree line is recommended to 'screen' manure sheds and dead-bird composters. 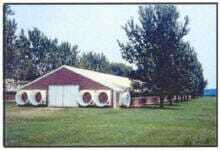 For tunnel ventilated farms this may involve two sets of tree lines, one near the tunnel fans and another to screen the manure and composter facilities. Property lines, dwellings, traffic visibility, surface and subsurface drainage rights-of-ways, overhead and below-ground wires also will enter into tree placement. Plant the RIGHT tree at the RIGHT place and for the RIGHT purpose! Every farm differs and a management plan must be developed to meet specific farm objectives and requirements. 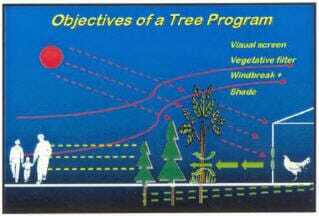 As shown in the diagram below, there are three major objectives (visual screen, vegetative filter and windbreak/shade) that need to be considered for each side of your farm. Desirable features of trees for poultry farms include maximum vegetative density with complex leaf shapes, waxy or "hairy" leaves for efficient filtering ability, tap or deep roots, wind tolerance, low maintenance and care, medium to fast growth and tolerance to nutrients found around houses. You may want to avoid shrubs and trees that attract wild birds due to seeds or nesting site and those with a wide crown that obstructs traffic. For information on recommended trees in your area, call your county Extension office or local Conservation District. The urgency of implementing a 'privacy' screen, vegetative filter or windbreak may dictate both the selection of tree species and size of the stock to plant. 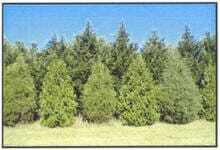 Windbreaks should not be one single species, but contain a diversity of tree and shrub species. If you invest in larger stock or plant during warm weather, consider installing drip irrigation to ensure survivability. Do not plant any invasive species of shrubs or trees on your farm. Planting recommendations depend on your location, particular situation and need. Site preparation for weed management is a critical preparation step, especially during the first few years of establishment. Weeds compete for nutrients and water. Once the trees are established, maintenance requirements are significantly reduced. You may want to use tree shelters when planting hardwood seedlings The distance between trees within and between rows depends on such factors as plant species, objectives of the planting, farm situation and width of your mowing equipment. The windward side of your windbreak should contain evergreen species that retain their lower branches close to the ground, or you may need to interplant evergreen shrubs to compensate for the opening. In some situations, it may be desirable to make plantings over multiple years, plant trees with different ages of longevity and, in some cases, thin the trees as the windbreak matures. If you are interested in obtaining federal, state, county or private cost-share assistance, contact your local Cooperative Extension or Conservation District office about potential funding opportunities. Longrange planning is essential when considering a tree plan for your farm. A tree plan will need to be developed and stock ordered well in advance of the ideal planting time for your location. Without prior notice, your trees/shrubs may not be available when you are ready to plant. If you choose not to participate in a cost-share program, seek guidance on developing a tree plan for your poultry farm. Your Poultry Specialist, local Cooperative Extension office or Conservation District can assist you with your plan. The cost of planting tree seedlings on poultry farms is relatively inexpensive. However, there will be additional labor, site preparation and maintenance costs. Both hand and mechanical tree-planting equipment may be available from your state forestry department. Check to see the availability of the equipment and the cost of having them custom-plant your trees. Written by George W. Malone, Extension Poultry Specialist and Dorothy Abbott-Donnelly, Extension Agent-Renewable Resources.